At nearly every public event I hold, I get a question about mental health care in our state. A February 2018 poll from the Des Moines Register found 73% of Iowans believe our mental health system is in crisis or is a big problem. Given that nearly one in five Iowa adults — and many Iowa children — live with some form of mental illness, this should be a top priority. 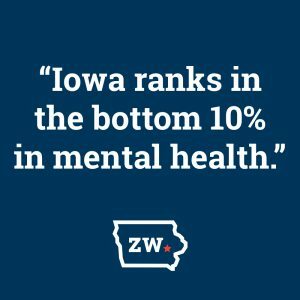 And yet, Iowa consistently ranks in the bottom 10% of American states in every single category of mental health programs and services. Our state ranks 49th nationally for mental health hospital beds with just sixty-four mental hospital beds in the entire state for Iowans with mental illness! But unfortunately, that’s just the beginning. We do need more beds, but as I’ve had conversations with providers, patients, and advocates, it’s become clear our state lacks a positive vision for the future of mental health care in our state, despite a near-continual string of redesigns and working groups. The status quo — which virtually everybody agrees is unacceptable — has been built ad-hoc with no unified plan and no clear direction. As a result, navigating the system is exceptionally difficult for patients and their families, especially when mental health issues are compounding other challenges, like food insecurity, underfunded schools, or privatized Medicaid services. We have to do better. We have to ensure that all Iowans can stand on a solid social foundation of effective mental health care. Emergency Action — I’m glad to see the Reynolds Administration finally taking emergency action to implement improvements to our mental health system. Johnson County is currently moving forward with one of these new mental health care access centers, which is an important step. I will be watching closely and listening to experts and patient families to see if these improvements help. Mental Health for Children — I was dismayed to see there is nothing about children in Governor Reynolds’ mental health plan. I hope this changes quickly. The Iowa Chapter of the American Academy of Pediatrics has reported that depression and anxiety are skyrocketing among our teenagers. And for younger kids, behavioral challenges are often driven by chaos and stress at home. Without proper care, these challenges can grow into lifelong struggles. We have to support parents who are trying to help their kids. Rural Mental Health Crisis — The mental health crisis is especially acute in our rural communities and small towns, where the suicide rate has spiked dramatically over the last fifteen years. The Gazette reports: “Rural communities have been particularly impacted by the opioid and suicide crises over the past 15 years. Before 2000, rates of drug overdoses in rural communities had been lower than in metro areas of the country. Drug overdose death rates increased sevenfold in rural America.” We should understand there are unique factors impacting people in these areas and approach the problem accordingly. While I believe our Department of Human Services is working hard to fix the problems plaguing our system, we are still in a state of crisis. We can’t keep making the same mistakes and expect a different result. We need a new vision and a new approach. One option to build that shared, positive vision is a Blue Ribbon Commission on Mental Health Care in Iowa. Developing a workforce trained to work in mental health, with adequate education and compensation. Terry Branstad once ran for governor with the slogan: “Iowa: A State of Mind.” In order for Iowa to be that “state of mind,” we must have a strong foundation of effective mental health care services we can count on when we need them.